My personal notes collected while messing with Ubuntu 6.06 (server) on my Mini-itx M10000 Nehemiah based server (with the OS running of a 2GB CF card, and a Hauppauge PVR-350 for experimental reasons), Ubuntu 7.04 on my IBM ThinkPad T23 and Ubuntu 7.10 on my T40p. That explains a problem that's a bit diffirent, but this works for my problem too. Okay, so I originally ordered the Home Edition, but as the store didn't have that they gave me this Studio Edition at the same price (they're almost identical, just the colour and FireWire speeds are different, oh, and the Studio is formated for Mac). Anyways, I wanted to use EXT3 for the drive, so I installed Ext2 Installable File System for Windows on my Windows box, and formatted the drive on my laptop (currently running Ubuntu 7.10). But then I came across this great page: Recovering reserved space in ext2 and ext3 filesystems which explains that 5% are reserved for the root user and that you can use tune2fs to make that space available to other users! As I'm only using the drive for data storage, there's no need for reserving data for root. And I now had 917G free space, nice! As a bonus, it even looks like WD's Drive Manager Status utility in Windows works with the ETX3 file system, and shows the used space on the drives LED array! For my HTPC setup I have to read a smart-card to get the keys to decrypt the digital cable (DVB-C) signals. 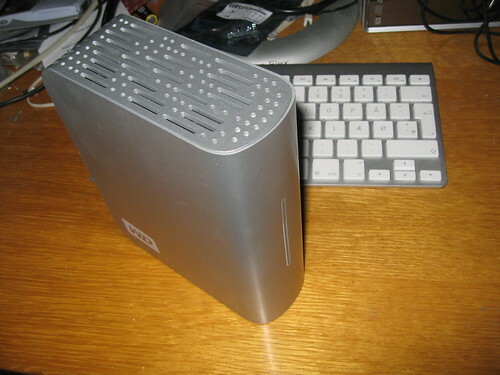 I desided to run this card server on my little server (currently running Ubuntu 6.06LTS on my T23). The hardware (a Phoenix/Smartmouse cardreader) is connected through a USB to Serial interface, so it comes up as /dev/ttyUSB0 on my computer. But it's a bit different on my Ubuntu machine, so I'll try to run through it here. I placed Newcs in a directory under my home dir, but you can put it where you like. You can copy the file that comes with Newcs that's called newcs.xml.phoenix to that location. While we're testing the server, just run it with ./newcs.i686 this will show you what the server is doing while it's running. Hopefully it'll show you that it has found the smart card, that it's adding the keys, and that it's starting the servers you've chosen. When the multidec plugin asks the server for keys you should see messages about that too.